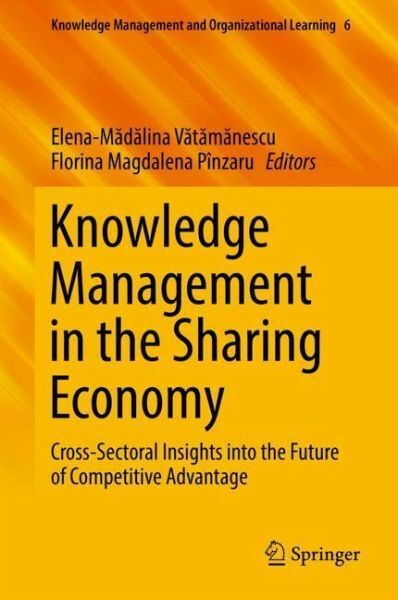 This volume explores the challenge of engaging knowledge management in a sharing economy. In a hyper-competitive business environment, everything tends to be digital, virtual and highly networked, which raises the issue of how knowledge management can support the decision whether or not to share strategic resources or capabilities. 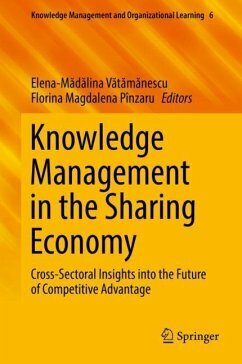 The book answers questions such as: to what extent does the sharing economy preserve or compromise the competitive advantage of organizations? And what are the knowledge-management strategies for competitive, yet cautious sharing dynamics? Elena-Madalina Vatamanescu is Associate Professor at the Faculty of Management (SNSPA, Bucharest, Romania). She is Associate Member of the International Association for Knowledge Management (IAKM) and Deputy Head of the Research Center in Management and Leadership within SNSPA. Her main research interests are: business internationalization, knowledge management, intellectual capital, organizational diagnosis and online social networks. Florina Pînzaru is Associate Professor and Dean of the Faculty of Management (SNSPA, Bucharest). She is Associate Member of the International Association for Knowledge Management (IAKM), Head of the Research Center in Management and Leadership within SNSPA and Editor-in-chief of the Journal of Management Dynamics in the Knowledge Economy. Her main research interests are: social media and digitization, online marketing, sharing economy and SMEs development strategies. - Introduction. - The Crazy New World of the Sharing Economy. - Reshaping Competition in the Age of Platforms. The Winners of the Sharing Economy. - The Sharing Economy in Post-communist Societies: Insights from Romania. - A Synthesis of the Sharing Economy in Romania and Russia. - Behind the Sharing Economy: Innovation and Dynamic Capability. - Nonprofit Organizations and the Sharing Economy. An Exploratory Study of the Umbrella Organizations. - The World I Know: Knowledge Sharing and Subcultures in Large Complex Organisations. - Knowledge Sharing as a Driver of Competitive Advantage: Two Cases from the Field. - The Nature and Dimensions of Knowledge Mobility for Competitive Advantage. - The Impact of Knowledge Management on the Market Performance of Companies. - Outsourcing and Business Networks in Top Southeastern European Banks: The Quest for Competitive Advantage. - Developing Instruments for Evidence-Based Policy Making: A Case Study in Knowledge Management for the Public Sector. - Knowledge risks in the sharing economy. - Beyond Innovation: The Crazy New World of Industrial Mash-ups.